In the late 1850s, gold was discovered in the Fraser River and Cariboo districts of British Columbia. The gold rush that followed brought a large influx of new inhabitants, changing the colony virtually overnight from a small settlement based on trading to a rapidly expanding one. The almost complete lack of a circulating medium occasioned great inconvenience. In 1859, Governor James Douglas requested Her Majesty's government to ship out a specified quantity of gold, silver and copper coins. Silver and copper coins amounting to little more than half the value requested were shipped, but no gold coins. The governor, well aware that California had solved a similar problem during the gold rush of 1849 by minting large quantities of the newly-mined gold, decided in 1862 that the most logical and direct way to meet the situation was to set up a mint at New Westminster and coin $10 and $20 gold pieces. Minting machinery was purchased in San Francisco, and the dies for the first coins were engraved there by a renowned engraver, Albert Kuner. Production started shortly thereafter. Specimens of the new coins were sent to Great Britain but the whole plan met with immediate disapproval. 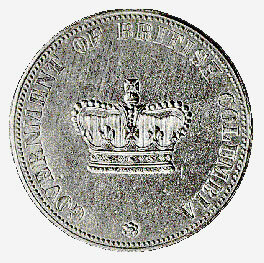 The right to strike and issue coins was the prerogative of the Crown, not of an official in a remote colony. No more coins were struck and the mint was dismantled. The exact number of pieces produced is not known, as the mint records have disappeared. At present, nine $20 gold pieces and seven $10 gold pieces are accounted for in public and private collections. The last piece to come on the market was the $20 gold piece in King Farouk's collection, which was sold in 1954 for �1400. It is estimated that if a piece came on the market today it would bring not less than $200,000. The piece illustrated is an electrotype reproduction produced for the Bank of Canada's National Currency Collection by the Royal Mint, London.